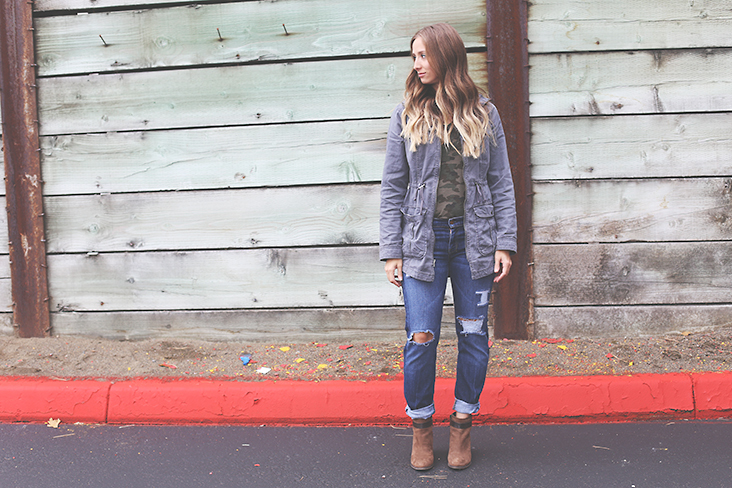 Fall has arrived, and it feels great to trade in shorts for sweaters, jackets, and jeans! 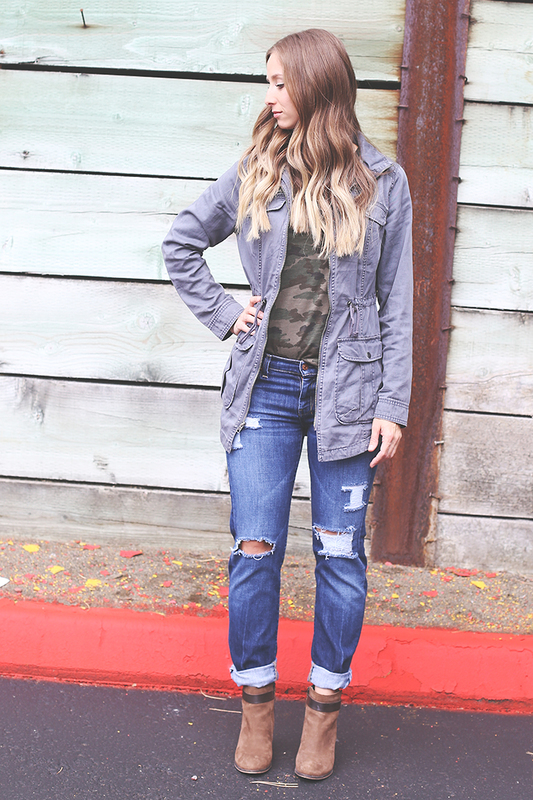 One of the hottest denim trends right now is distressed jeans, and I’m a big fan! 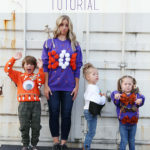 Today I’m sharing a how to distress jeans tutorial, and you’ll spending a fraction of what you’d pay in a retail store! 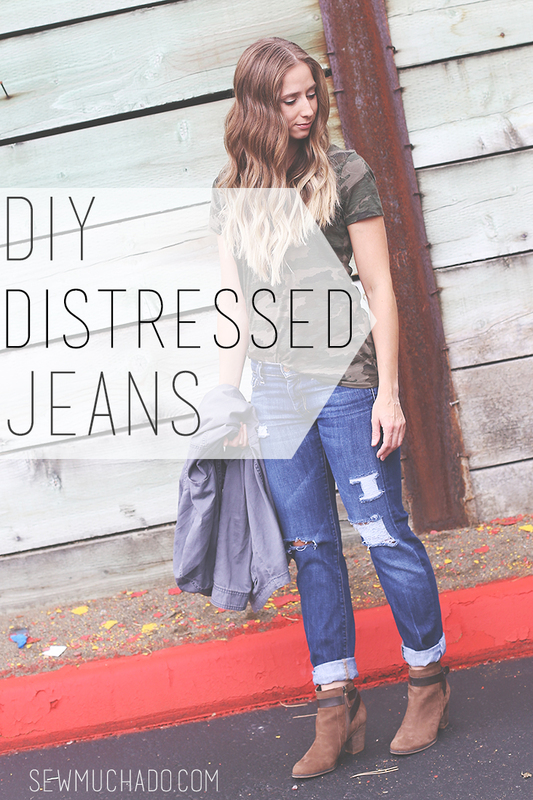 Once you learn how to make distressed jeans, you’ll never go back to buying them! 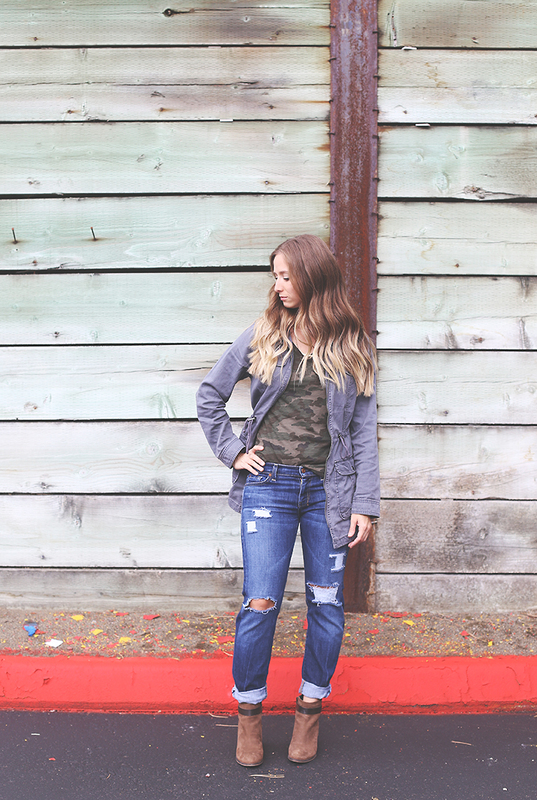 This pair of distressed jeans has definitely become a staple in my wardrobe! 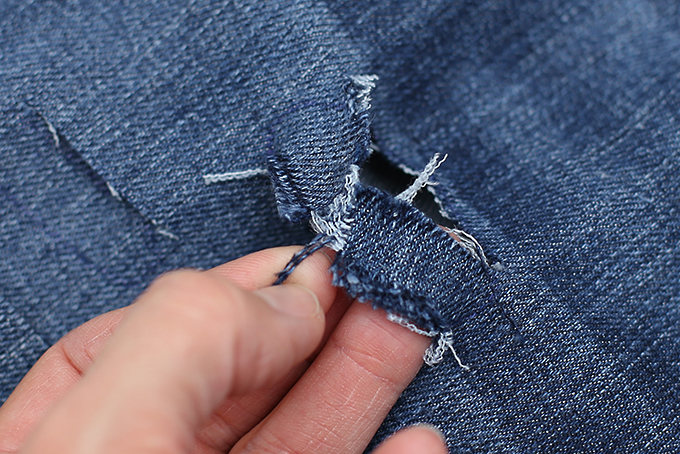 Learning how to distress jeans is much easier than you may think, and can save a lot of money over buying them from a retail store. 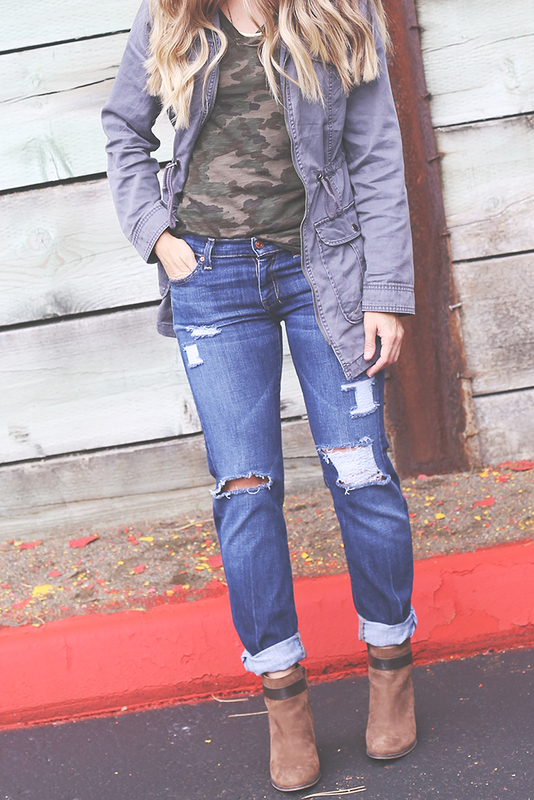 I picked up this pair of designer jeans from a local thrift shop for under $10. 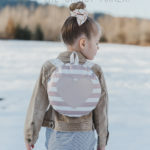 The fit of the top was great, but I didn’t like the wide legs, so I used this tutorial to bring the leg widths in to exactly how I wanted them. 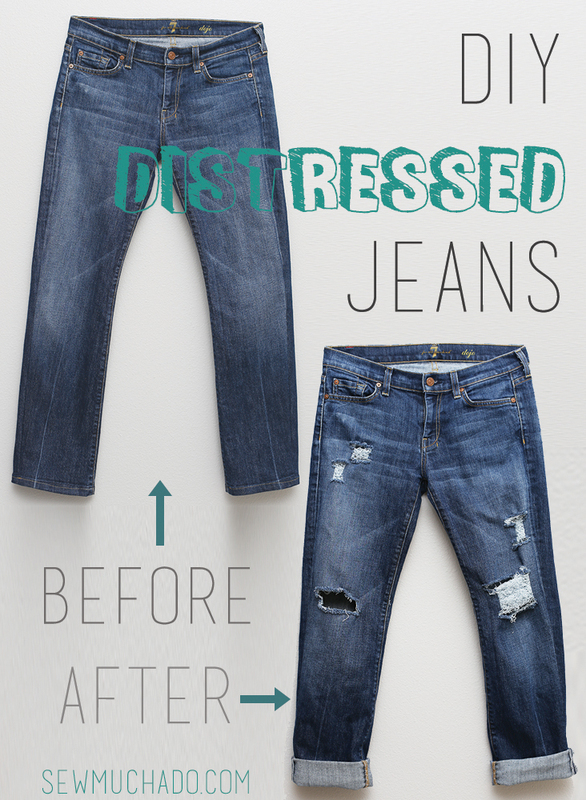 Distressing is one of those things where you really can’t go wrong – distress a little or a lot, and it will still look great! Ready to get started? 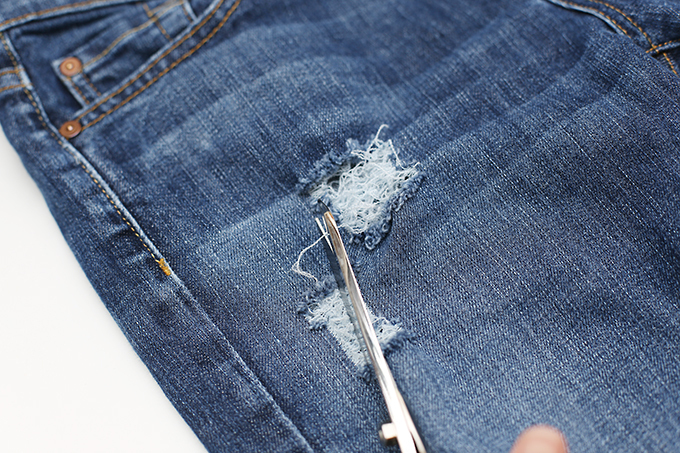 Soon your friends will be asking you to teach them how to distress jeans! 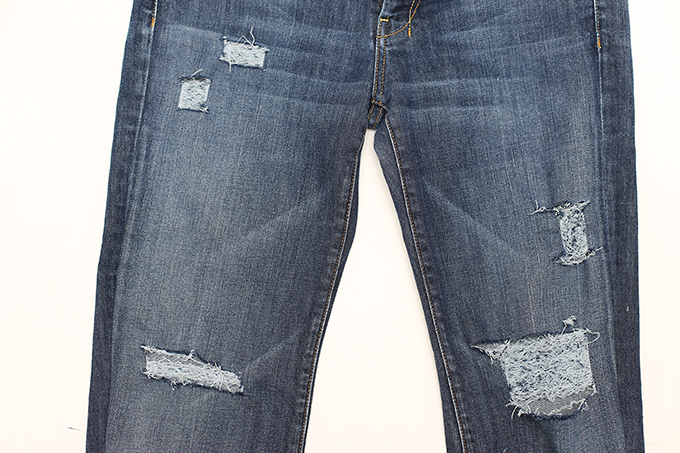 It’s time to learn how to make distressed jeans! 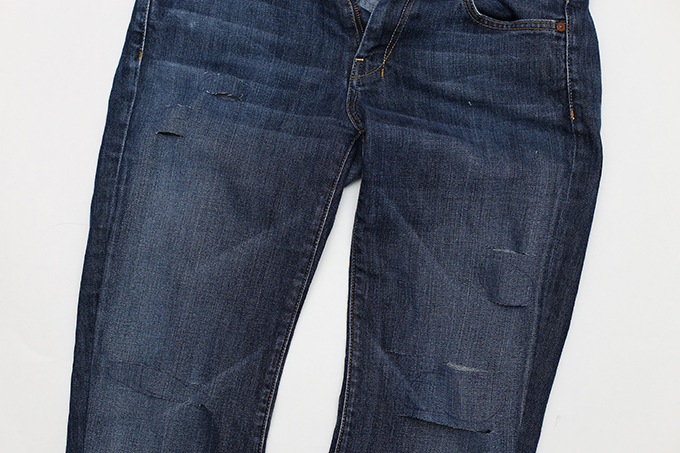 Once you learn the basics of how to distress jeans, it’s a cinch. 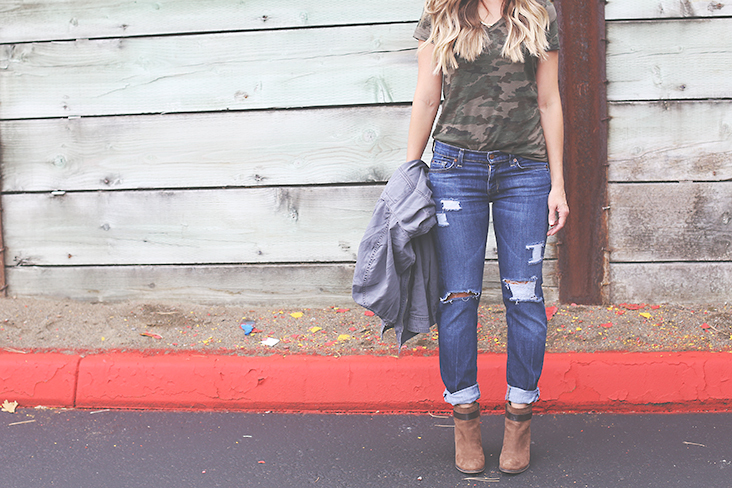 Begin by putting your jeans on. 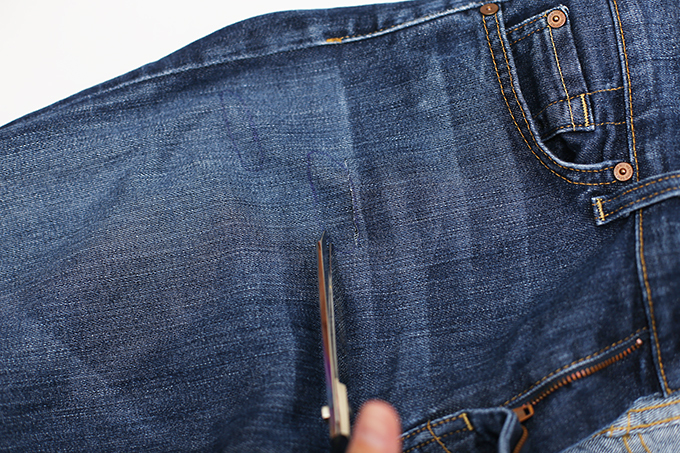 Stand in front of a mirror and use tailor’s chalk or a disappearing ink pen to mark the areas you’d like to distress. I chose to mark each knee and smaller areas on each thigh. 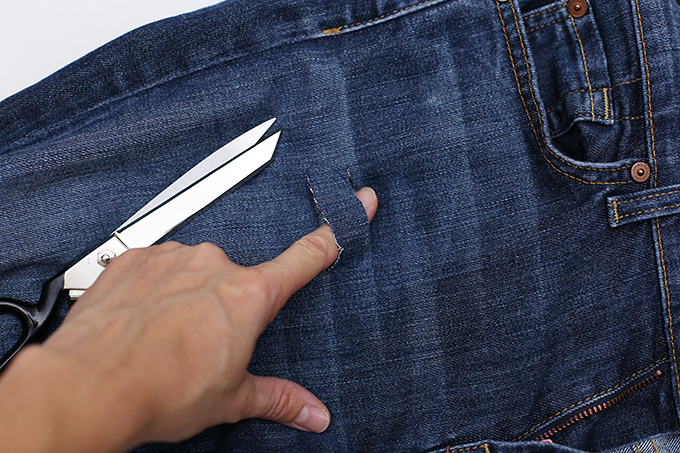 Use scissors to cut a horizontal slit at top and bottom of each marked area. 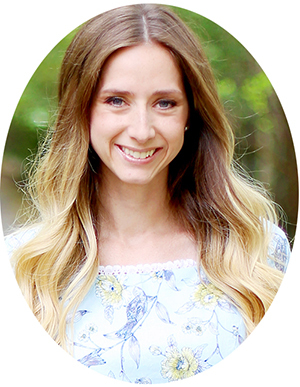 Look closely at the fabric, and you’ll notice that the white threads are horizontal and the blue threads are vertical. 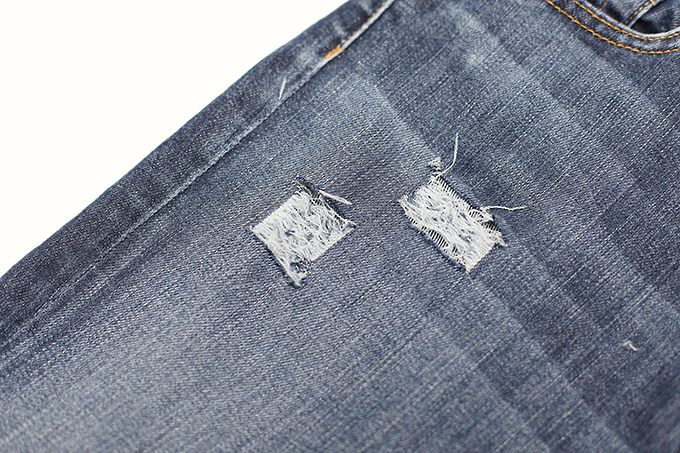 Use a seam ripper to carefully remove only the vertical blue threads. The first few threads are the trickiest to remove because of the tight weave, but it gets easier once a few are missing! If you want an open hole with no white threads, you can cut around the entire hole. 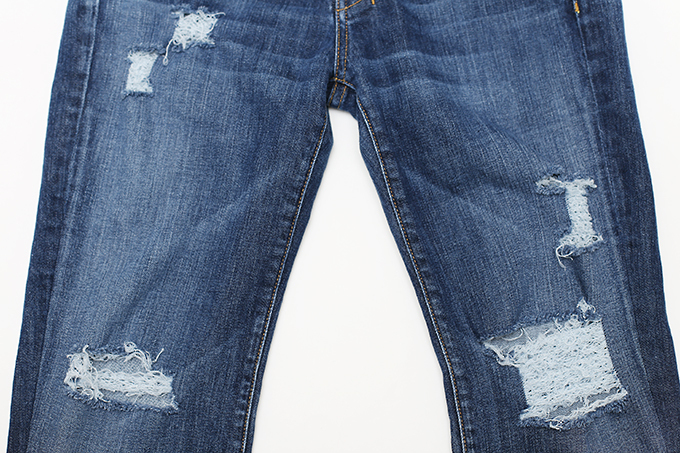 It is best if the hole is not uniform for a more authentic look. For added distressing, use coarse sandpaper to rough up any areas you’d like to. 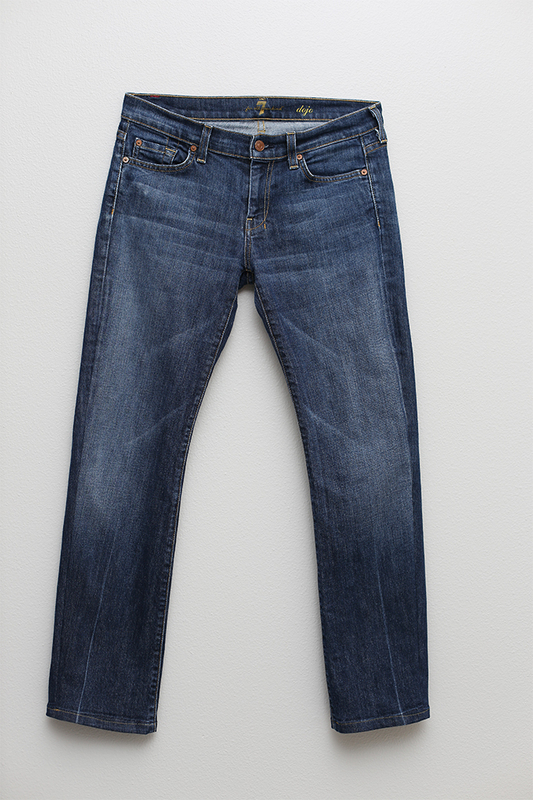 Next, wash and dry your jeans as you normally would to allow the edges to fray further. 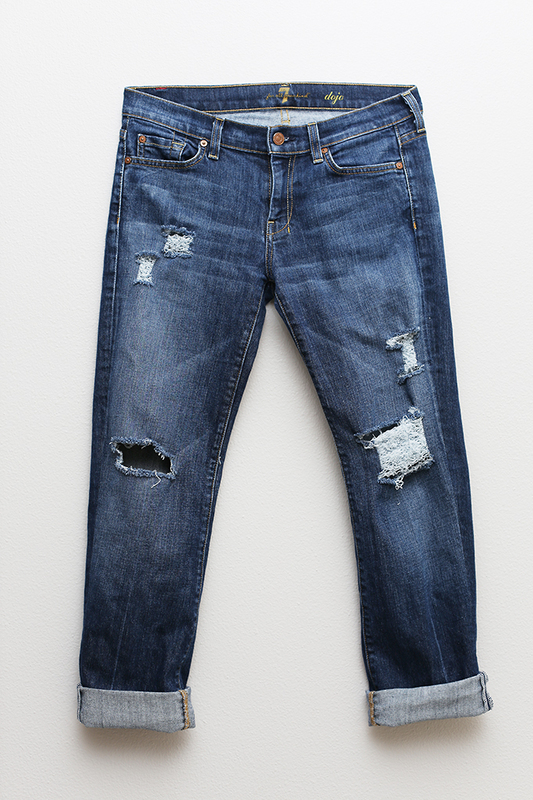 This gives you a better idea of how the finished jeans will look over time, and is a great time to clip any remaining loose threads and adjust the distressing as needed. For this pair, I didn’t love how one of the knees looked after washing, so I cut the white threads to make an open hole, and it was much better! Great job! 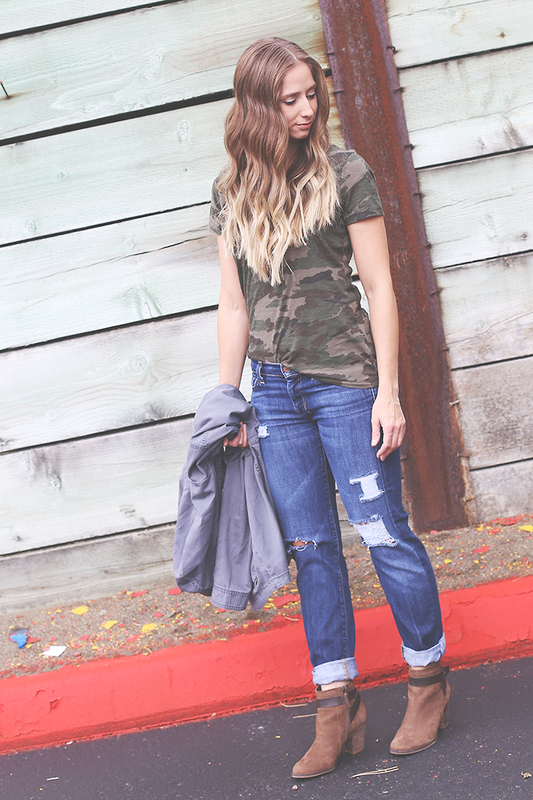 Now that you’ve learned how to distress jeans, have fun styling them with your other closet must-haves! 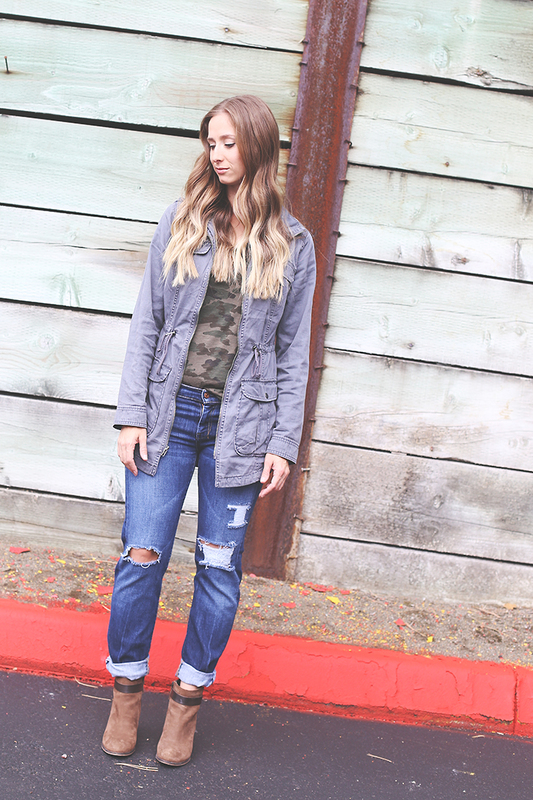 Layer them with your favorite tshirt and jacket, and you’re ready for Fall! 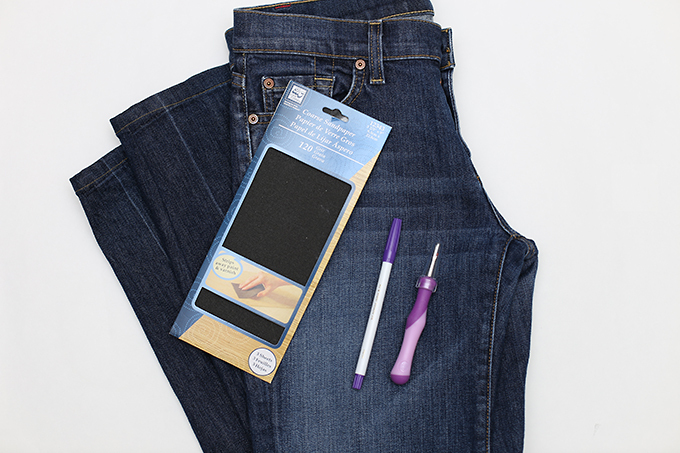 If you enjoyed learning how to distress jeans, check out more jean alteration tutorials below! Were you stalking my google search from the last few days? 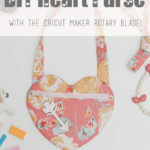 This is exactly what I have been looking for so I can distress my overalls! Thanks lady!! Haha, how did you know?! I’m busted ;).